SEEKING MURALIST! 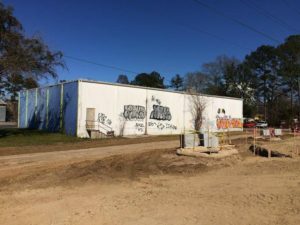 The back of The OTHER SIDE Vintage in Railroad Square Art Park is going to be highly visible from the new Greenway & the new Famu Way, which is opening up soon. We at Railroad Square are seeking someone to do an awesome mural there. Note: if you are not a licensed painter then you will have to “work under” a licensed painter. If you do not know one then we may be able to find one for you. Please send an email to Adam@RailroadSquare.com if interested. Please include photos or portfolio link of past work.